The only switch on the SODAQ Moja board is an on/off switch. In off state the solar charge circuit is still active and the real-time clock is still powered. Make sure that also when programming the board the switch is in the ON position. Next to the switch there is a two pin header for an external on/off switch. If you want to use the external on/off switch make sure the switch is in off state. The FTDI driver adds a communication port. In Windows this is COMx (so COM1, COM 8, etc.). On Linux and Mac the port name starts with /dev/tty.. The SODAQ board can be programmed with the Arduino IDE. The latest version of Arduino IDE can be found at www.arduino.cc. The SODAQ board is tested with Arduino IDE version 1.0.5. 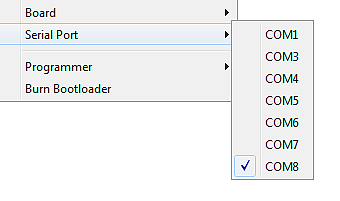 Before you can program the SODAQ you have to select the right board and port settings. You can select the board by going to Tools > Board > Arduino Pro or Pro Mini(3.3V, 8 MHz)w/ATmega328. When programming the SODAQ board, always make sure that there is no bee module in the bee slot. 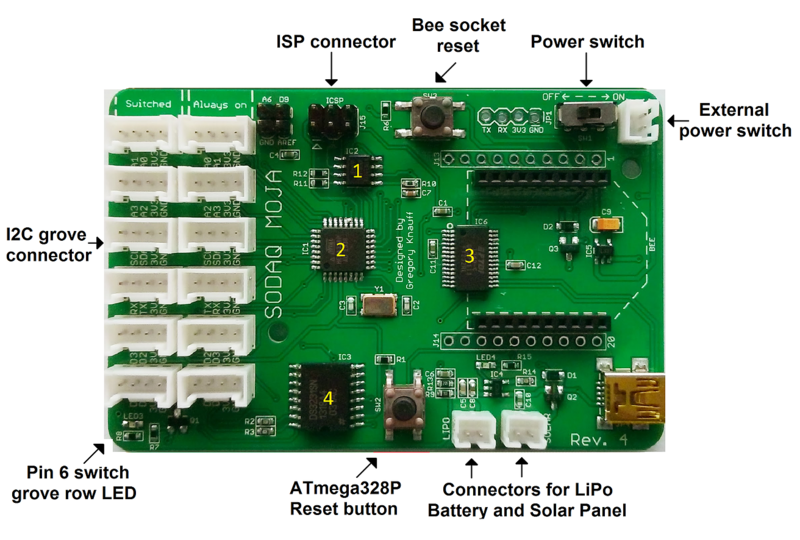 If a bee module is plugged in while programming the SODAQ board it may cause the programming to fail. This is because USB connector and the bee module are using the same connections for communication. The SODAQ board has two rows of grove connectors. They both contain the same I/O pins but one row can be turned on/off in software. The switched row can be used to reduce the energy consumption of some sensors. Make sure the maximum current of all sensors in the switched row is not greater then 115 mA. The switching of this row is done by actually switching the ground connection on/off. Therefore if you are using the switched row with a cable, make sure you are not using any other ground connection then this cable. Otherwise the switching will not have effect and the attached device will always be powered. The real-time clock is connected with the I2C lines of the ATmega328p. The RTC keeps information about seconds, minutes, hours, day, date, month and year.But this chip can also measure temperature with a ±3°C accuracy. Now you are ready to start using the DS3231 in your code. On/Off switch. With the switch in Off position the solar charge circuit is still active and the RTC clock is still powered. 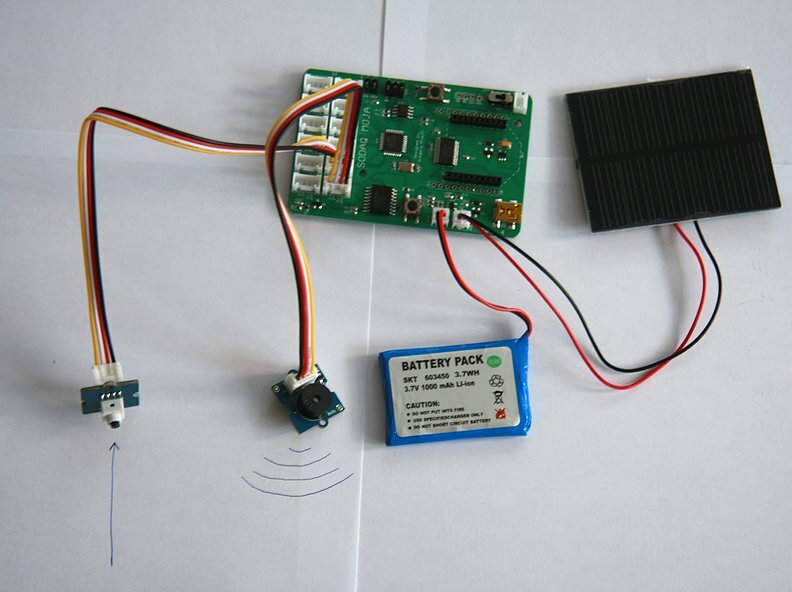 In this tutorial, you learn how to create an alarm noise on a buzzer and how to activate it with a button. First, plug the buzzer into the D4/D5 pin in the always on row. Then, plug the button int the D2/D3 pin in the always on row. Next, plug the 0.5W solar panel and the 1A LiPo battery into the respective sockets.